Everybody knows by now that Desmond strives for releasing best value for money products, meaning a very decent quality at a very low budget. But this time I had to ask twice to confirm that the price of their new IMP Mini tabletop tripod was correct. 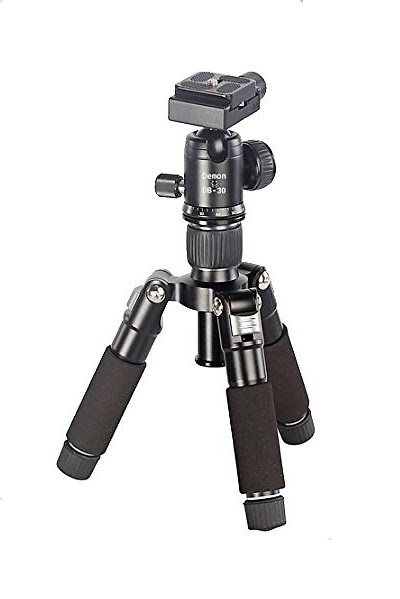 Yesterday I wrote about their small Demon DB-30 Mini Ball Head selling for a mere US $ 24.95, well just imagine that, for a limited time though, you can get a complete table top tripod including the head with a QR plate just for a few dollars more. 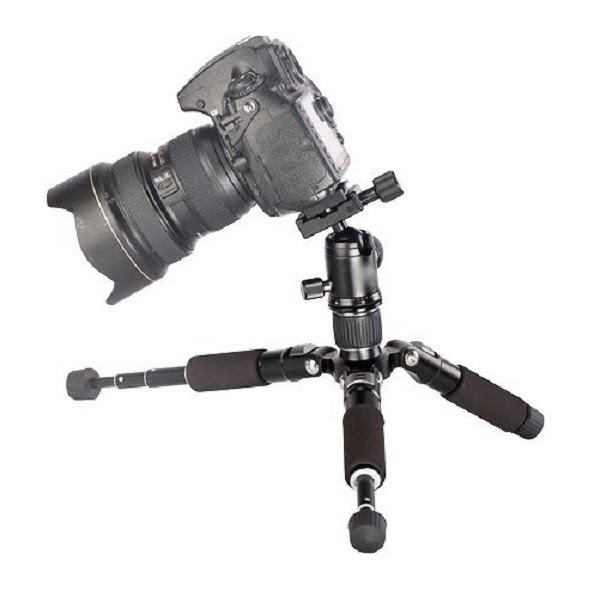 The IMP Mini Tripod is indeed a mini tripod and not a simplified tabletop pod with three legs. 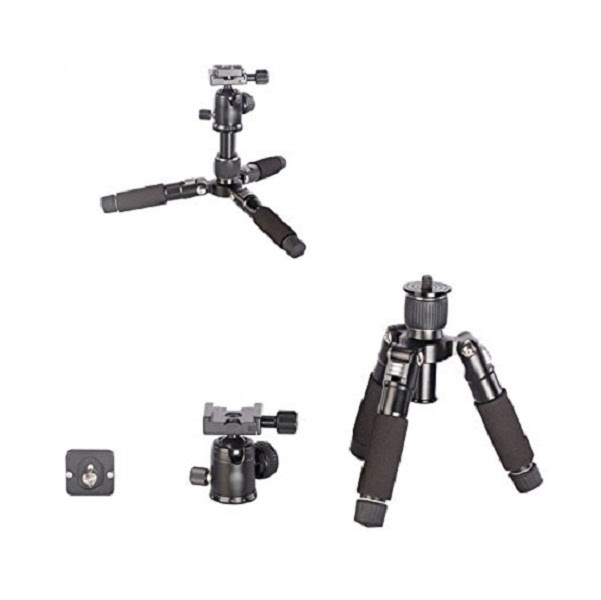 Of course there are three legs, but the aluminium hub (spider) is more robust coming from a larger tripod, with a mini removable center column. The hub also features hings with spring loaded angle stops that permit reverse folding of the legs for minimum size. All three Alu legs are covered with closed foam grips for comfort as well as temperature isolation and have rubber anti-slip feet. 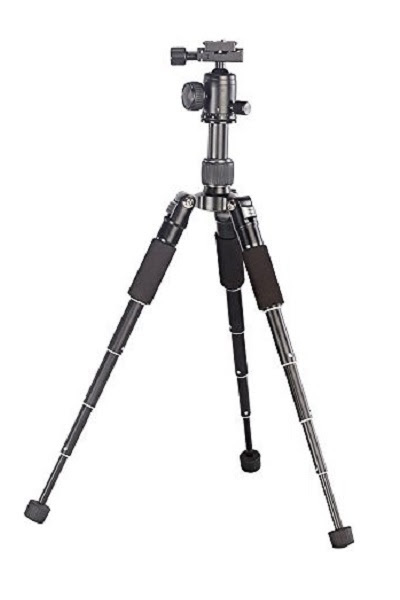 Somehow, this is not a mere table top tripod with a small center column, since the legs are telescopic with five short sections allowing for a mid height of 52 cm. The legs are easily extended and when twisted counter-clockwise lock one within the other holding up to 5 kg gear. A twist clockwise will release the leg section desired to retract within its upper larger tube. Nonetheless, its angle stops permit an almost horizontal leg positioning for ground level or table top flat use. As mentioned in the beginning the IMP Kit is comprised by the IMP pod itself, the Demon DB-30 Arca compatible 30 mm ball head with independent pan lock and a quick release Arca style camera plate with safety stops. Introductory - limited time - price for the Desmond IMP + DB-30 head is US$ 28.95 and is available either from Amazon or from eBay.